Just about everyone must have seen the incredible steampunk keyboards custom built by Datamancer – but this one was new to me. I guess he’s been busy. And it’s pretty much right up my street, so if anyone’s got about $1500 or so lying around, well, Christmas is coming, right? This art deco computer keyboard was a custom project for the counter at Cinema 16:9 in Lansdowne, Pennsylvania. 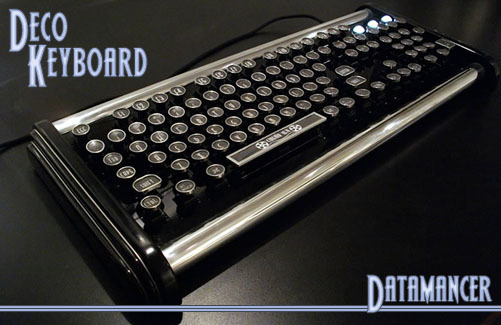 It’s made of wood and chrome with bright white LEDs and reworked vintage typewriter keys. I’d sure love to spend my days hovering over one like it. Some of his other recent work is a series of ‘Aviator‘ keyboards, which are sort of halfway between the Deco keyboard and his earlier steampunkery: the Aviator’s a Dieselpunk model. Among the notes and sketches at the Datamancer site are some other Art Deco bits in progress. I guess I’ll be checking back more often now! 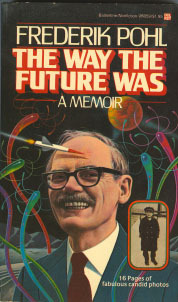 And speaking of Captain Future… or, more accurately, speaking of the Futurians and the Golden Age… why don’t you go wish Frederik Pohl a happy 91st birthday? 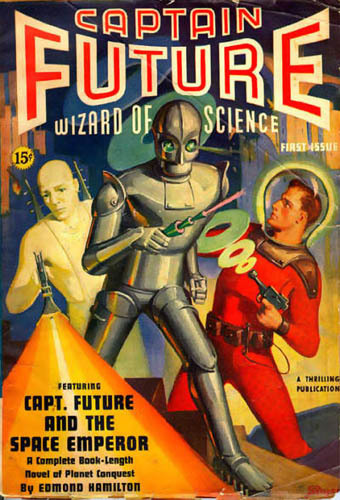 At i09, Jess Nevins continues the history of science fiction pulp magazines by bursting into their golden age with the beginning of John W. Campbell’s long term at the helm of Astounding. 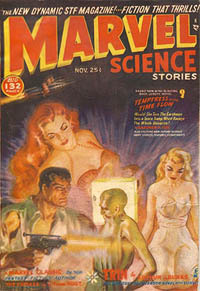 Nevins tracks the number of sf pulps across the years – through the war and its paper rationing, not to mention the military service of many authors (which, come to think of it, he doesn’t mention – but pulps being what they were, those publishers would surely have printed something if they were able). It’s also interesting to see which writers were publishing in each market even though their dizzying array of pseudonyms would make a complete list nearly impossible. But if you look carefully you can see the progress of fan writers like the Futurians beginning to break into the kinds of magazines that they’d lately been reading. Just last night I read Leigh Brackett’s The Veil of Astellar and Henry Kuttner’s We Guard the Black Planet! – both from the years that Nevins covers here – so this article was nicely timed for me. I’m making pretty good progress on the illustrations for The Lair of the Clockwork Book, even though I’m not as far along as I’d like. I’ve just finished the last of the pictures that takes place in Lew Stone’s lab during his adventure (which may be called Big Headed Guy and the Big Ball of Doom) but I’ve taken longer to get them done than I’d hoped. Because I Think Too Much, I’ve been considering why that is, and why that is interests me, although your mileage may vary. The biggest difference between this and the mildly interactive Trapped in the Tower of the Brain Thieves is that this story’s linear. 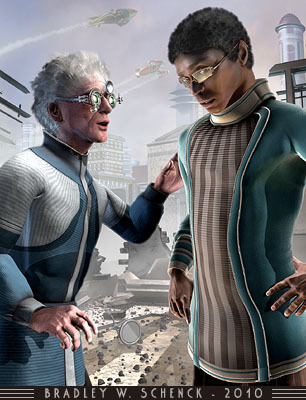 When Lew powers up the Chiralitron and begins his experiment he will always do that, in the same way, and the same thing will always happen. This is Captain Obvious speaking, by the way. As a side effect of this linearity there are fewer things that can happen – and so fewer illustrations – in any one location in the story. Why isn’t fewer faster? The problem is that building a complicated environment takes lots of time. Making a single picture in that environment takes awhile, too, but nowhere near as much. So the more illustrations that happen in one place, the less time – on the average – they take. You could say that I’m amortizing the time I’ve spent building the pieces that make the pictures. So I built Lew’s pristine laboratory and made the four pictures that take place there. Then I had to build Lew’s demolished laboratory and make the four pictures that take place there. If I’d needed to make twelve pictures in each state of the lab, the average time it took to make the pictures would be lower. See? So it’s not terrible news – things are just a little bit slower than I expected. This really bothered me until I did the math and understood why. But for the final set of pictures in Lew’s story I have some very different settings to create and those, thankfully, will go much more smoothly than the sets up to now. I’m concerned about what that does to the Clockwork Book‘s launch date – I’d hoped to start posting the story by the end of the year – but I don’t think I’ll be set back by all that much. Yep, it’s that time of year when all sorts of new merchandise becomes available just when everyone would wish things could settle down a bit for the holidays. But we can handle it. 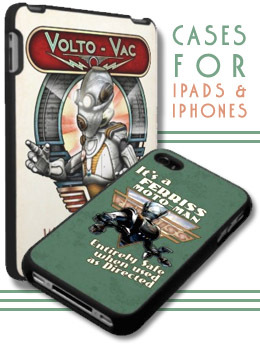 Today’s big news is that I’ve added these swell hardshell cases to my Retropolis site. They’re Speck® cases, which have a fabric back stretched over the body of the case, and it’s on that fabric that I’ve been able to print my designs. The fabric back – in addition to looking pretty neat – gives the back of your iPad or iPhone a much more grippable surface, or in the case of the iPad, a little more traction on your lap. That’s a practical observation that has nothing to do with what you were just thinking. I forgot to mention last week that I’ve also added a bunch of hanging ornaments (or pendants) to my selection of swag at Ars Celtica. 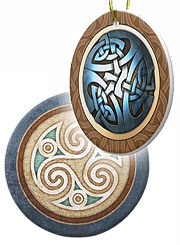 They’re ceramic ornaments that measure nearly three inches across, with designs on both sides. And of course in the middle of all that commercial product mongering I’m trying not to lose ground on The Lair of the Clockwork Book. I’m well along with the demolished version of Lew Stone’s lab, and once that’s all done I’ll be able to turn out the next four illustrations. This is always a crazy time of year for me; but if it was easy, they’d have got someone else to do it.